The first day of Chautauqua is here! 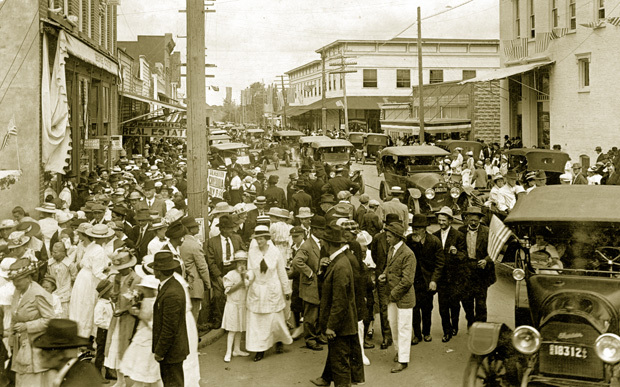 Or more accurately, the first day of Chautauqua week is here… The date was Sunday, July 9, 1916 and the excitement in the small community had been building ever since the first Chautauqua gathering ever to be held in Silverton was announced. Along with this excitement, there had been no small amount of trepidation that the event, to be held July 9-14, 1916, might not be a success. Numerous local citizens had put up a monetary guarantee to the company providing the Chautauqua to ensure a minimum number of ticket sales. Circuit Chautauqua was essentially the third iteration of the Chautauqua movement, named for Lake Chautauqua in upstate New York. Organized in the 1870s, Chautauqua was a predominantly American cultural tradition that emphasized the general advancement of adult education, initially emphasizing religious training; ultimately evolving into much broader areas of education, entertainment and enlightenment. The first sessions were held at the Chautauqua Institute on the shores of Lake Chautauqua in New York State. Later, many communities throughout the United States eventually established their own permanent Chautauqua organizations. As the expenses for these organizations increased, “circuit Chautauqua” was developed in 1904 as a sort of traveling road show, providing professionally developed programs at a reasonable cost to communities along the circuit route. The Silverton Chautauqua was managed by the Ellison-White Chautauqua Bureau, based in Portland, Oregon. One of the largest organizations of its kind, it provided organizational and logistical support for the Silverton Chautauqua. These activities included advance publicity, advertising, and setting up the large circus type tent in which the programs would be held. Perhaps most importantly, Ellison-White hired the Chautauqua “talent”, the various lecturers and other performers who would provide the entertainment. Local resident F.E Callister was the general chairman in charge of planning for Chautauqua week. Other local citizens active on various committees included Reber Allen, George Steelhammer, Dr. C.W. Keene, Percy Brown, George Hubbs, and Julius Alm. As Chautauqua approached, the July 7, 1916 Silverton Appeal devoted almost the entire front page to Chautauqua week, displaying large graphics at the top and bottom of the page. The schedule of events was displayed prominently in the center of the page, complete with a typesetting error that listed the year as 1816 instead of 1916. A typical day during Chautauqua week involved morning, afternoon, and evening sessions. Each 9:00am morning session involved the “Junior Chautauqua”, children performing “Organizing King Arthur’s Court.” The afternoon would showcase both a musical act and a lecture beginning at 2:30pm and 3:00pm respectively. The same would occur during the evening sessions, beginning at 7:30pm and 8:15pm. Patrons could purchase admittance a´ la carte for the morning, afternoon, and evening gatherings. Prices ranged from 15¢ for the Children’s Chautauqua morning sessions to a high of 75¢, with the majority costing 35¢ or 50¢, for the afternoon and evening events. People could also purchase season tickets that would allow admittance to any performance on any of the six days of Chautauqua week. Lecturers, also known as “platform speakers”, included Victor Murdock, Ernest J. Silas, and Arthur A. Franzke. Musical acts included Witepakie’s Hungarian Orchestra, mezzo-contralto Madam Fay Morvilius, The Gullotta Trio, and the Boston Lyric Opera Company. As it turned out, the original guarantors of the event need not have worried as Chautauqua week was a complete success. The Appeal reported in headlines: “Obligations All Met”, “Guarantors of Chautauqua Come Through Without a Scratch.” and “Money Over.” The article announced that a con-tract had been signed to bring Chautauqua to Silverton again the following summer, as would occur for several subsequent years. As the Great Depression approached, the Chautauqua movement petered out during the 1920s due partly to the influence of the new medium of radio, but that’s a story for another time.